Text your reg to 78 111 now! TextReg are not the first or the last company or organisation to begin offering vehicle status checks in the United kingdom, that was the company now trading as HPI Ltd and as such HPI and HPI Check are trademarks of HPI Ltd, Text Reg is in no way affiliated with HPI or the HPI Check) who originally began service HPI reports in the early 1900's. When HPI began it was a very manual process and a result could take many days, there was no database or website or even SMS or HPI check text. 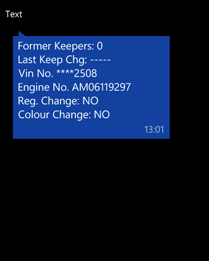 Nowadays it takes less than a few seconds to access the history of a car or bike and all for less than a few pounds. Best VDI text check bar none. 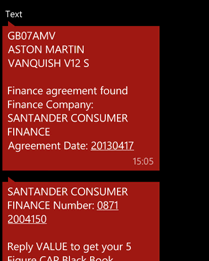 A quick SMS and away you go with all the information you need to buy a car. I have used them 4 times this week. Great service. 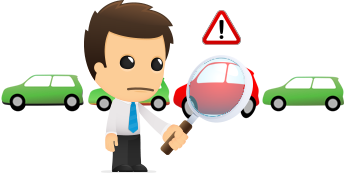 Getting a vehicle history check is one of the most important steps when buying a new car. 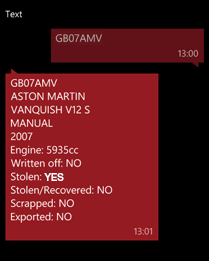 Here at Text Reg we provide you the very best service to enable a comprehensive Vehicle Text Check. By simply texting your registration to 78 111 you will receive a full £8 Gold report or if you require a bit less data, send Basic and the registration to 78 111 and thats just £3.00 plus your normal network rate. Full pricing details found here. Get piece of mind and Text your Reg to 78 111. Do it now.